Come to Tea with ALT’s “Little Women”! Albuquerque Little Theatre is thrilled to partner with the St. James Tearoom for a great event! A very special tea where the guests of honor are you… and ALT’s “Little Women” — Meg, Jo, Beth, and Amy! Enjoy Tea with the “Little Women” at the St. James Tearoom on Wednesday, February 6th, from 6:30pm – 8:30pm. Hear about the lives of these feisty, fun, flirtatious sisters firsthand as they join you at your table. Bring your friends for a fun evening of girl time, as the “Little Women” take you back in time. You’ll treasure this experience for years to come. Just $42 per person, tax and tip included. *Some of the proceeds from this wonderful event will benefit Albuquerque Little Theatre. **To register for the Tea, go to www.stjamestearoom.com and head to the “Events” page. **And before you meet them in person, see Meg, Jo, Beth, and Amy on stage! Albuquerque Little Theatre’s production of “Little Women” runs just two more weekends — *NOW THROUGH FEBRUARY 3RD! 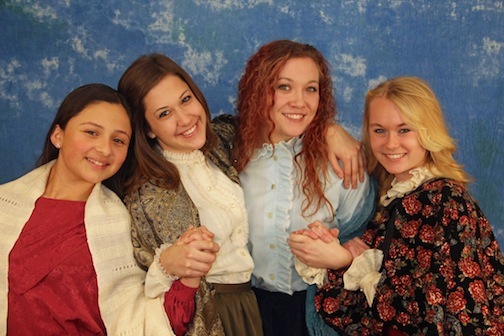 ← IT’S OPENING NIGHT OF LITTLE WOMEN! WE ARE SO EXCITED!